I have an odd scenario. 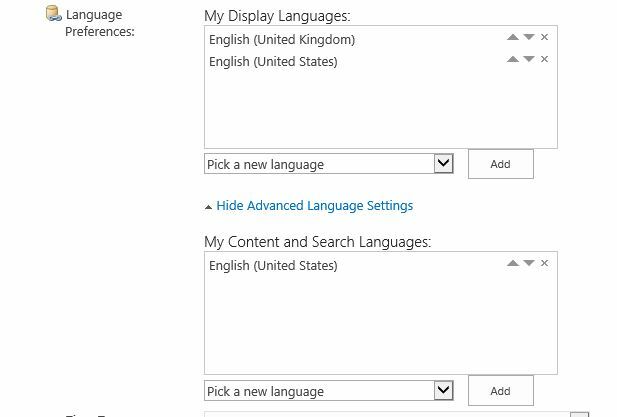 When I change the Language Preferences of a User using the Edit Profile Properties Page in the User Profile Service Application (SPS-MUILanguages ans SPS-ContentLanguages) the changes are not updated in the Users MySite. The settings are, however, correctly updated in the User Profile Service Application. Now, the weird thing is, if the user goes to it's my site and just clicks save on it's user profile, then the languages appear. After that updates through the Service Application also work. We can using the PowerShell below to update the SPS-MUILanguages and SPS-ContentLanguages properties of user profile. Well, I finally figured it out. There is another class which is called SPUserSettingsProviderManager. It has methods to set the User's display and content languages. Not the answer you're looking for? Browse other questions tagged sharepoint-server user-profile-service mysite or ask your own question. Default placeholder is not loading in my sites in SharePoint 2013?